This product is out of stock until September 30, 2019. If you order now, we'll send it to you as soon as we are restocked. Any questions? Email us. A high-quality, lightweight and easy way to protect your snowboard. The EVOC Neoprene Snowboard Cover is a great way to protect your board's edges and base. If you're looking for a lightweight and easy way to protect your board, this is it. This neoprene cover is great for day trips, indoor storage, or car trips. Adjustable straps: The snowboard cover features three sets of adjustable straps with YKK buckles. Full edge padding: The padding wraps around the nose, tail, and all of the edges to provide 360 degrees of coverage. Elastic design: The neoprene material used to construct this bag gives it the added feature of being flexible, stretching to fit your board snugly. EVOC is huge in Europe and is just breaking into the scene here in the states. For years, European skiers, boarders, and cyclists have been raving about the high quality and attention to detail of EVOC products. EVOC products are German engineered and designed and they live up to the German engineering standard - which is to say they are awesome! EVOC are material and design specialist. Every piece of equipment is not only built with the best material, but is also designed to be as functionally relevant as possible. EVOC was founded by riders for riders, so if you're looking for some of the best gear, then you're in the right hands with EVOC. Hi, I want to know which size will fit my board. What is the width of the board that the small size will fit? For this snowboard cover, either size will fit a board that is up to 30 cm wide at the waist. The only difference in the bags is the length of the boards they can fit. What size do I need for myEmpress 158 cm Snowboard? Either size of this Snowboard Cover could work for your board, at 158 cm long - but you probably want to go with the larger size, since that length is about as along as the smaller size will hold. This snowboard cover will fit the width of your board -- you would just need to pick the size (small or large), depending on how long it is. The small size will fit a board up between 145 cm to 160 cm long (from over 4 feet long but not much more than 5 feet long), and then the larger one will fit a board between 155 cm to 170 cm, so between about 5 feet to 5.5 feet long. The widths for both sizes are the same, so either would work for how wide your board is. Purchased this snowboard cover for my son and he loves it. It is lightweight and easy to store and most importantly it protects his board base. I would highly recommend this to anyone looking to protect their snowboard. The snowboard covers made GREAT Christmas gifts. They fit the boards perfectly. The covers offer protection for the boards during transport & storage. The process was easy. They arrived in a timely manner....well packed & ready for wrapping. Finally! A protective sleeve for my board! I love it!! It's simple and sleek and hugs my board snuggly. I'm excited that I don't have to use my ski jacket and pants to protect my board's edges and risk damaging my ski gear too. Neoprene is thick and sturdy and I can't wait to put it to use in a few months. Love love love!! Airport handling is rough and my board's edge has cut through two snowboard bags so far. This is a perfect solution, field tested 4 times so far. Exactly what I was after. I just slip it in the sleeve and drop it in my bag. Board is a 159 wide. Wrap your board in neoprene softness. When a board bag is too much, what do you do? These sleeves provide protection to base, edges and top sheet when transporting your ride. have ordered seven for multiple boards. use it in the box, in the boot and in the bag for extra protection. I was looking for somthing to protect the base of my race board while traveling. This was the perfect item for that. However the nose and tail of my donek saber BX doesn't have the best fit for I have to use a decent amount of muscle to get it to fit but other that that. Excellent!!! I take day trips a lot, often using public transport. This is perfect for not catching a strap hanger with a wayward board edge. Set your boots in your bindings and you're good to go. Also works well as padding if you combine with a sling bag for weekenders, saves the need for a massive roller on those short trips. Great product! Very well constructed! Brings peace of mind when throwing my board in the back of a pickup. Great product, fits snug, and is just right for those day trips or bus trips to the Mtn, protects your board while stowed away in the car or bus. Highly recommend, I have 2 of them. This is a great product for storing or transporting your boards. 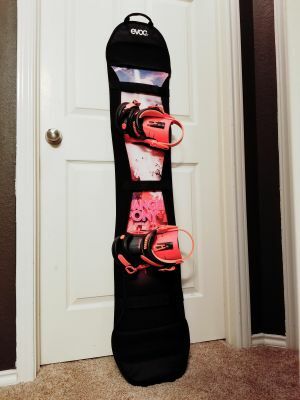 The cover protects the edges of my snowboard as well as prevents me from damaging the closet in which I store my boards. This cover has also been great for transporting my boards from place to place since I can toss in my pickup truck and not worry about scuffs and other damage. Saw this design at Copper Mountain for the USASA Nationals, but no one have them in stock. They cover the board well and aren't bulky like a bag. I wish they came in something other than black and that they had a handle in the middle, no on the ends. The ends might be nice for pulling it out of your vehicle, but you aren't going to carry it from the ends of you board. You still have to carry it like it didn't have a cover on it and since my kids has 3 boards, it is still difficult to get them around carrying them like this. But considering their scarcity, they are really nice. Perfect for its use on point for cost.